I am ready to bet that more than 95 percent of people reading these lines have used or are currently using Instagram as part of their daily routine. 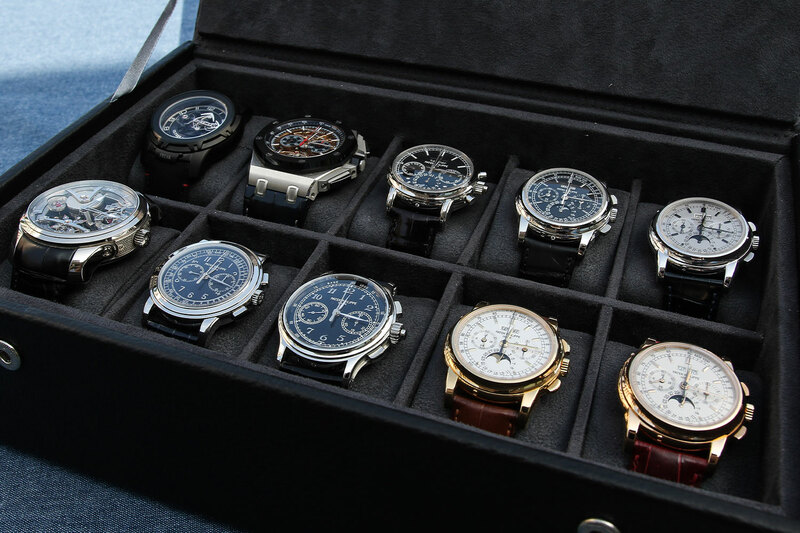 For us watch nerds and enthusiasts, it’s the perfect haven to showcase and share our private collections with like-minded collectors. The beauty of Instagram is that it takes minimal amount of information to create an account, making it so easy to hide behind pseudonyms. 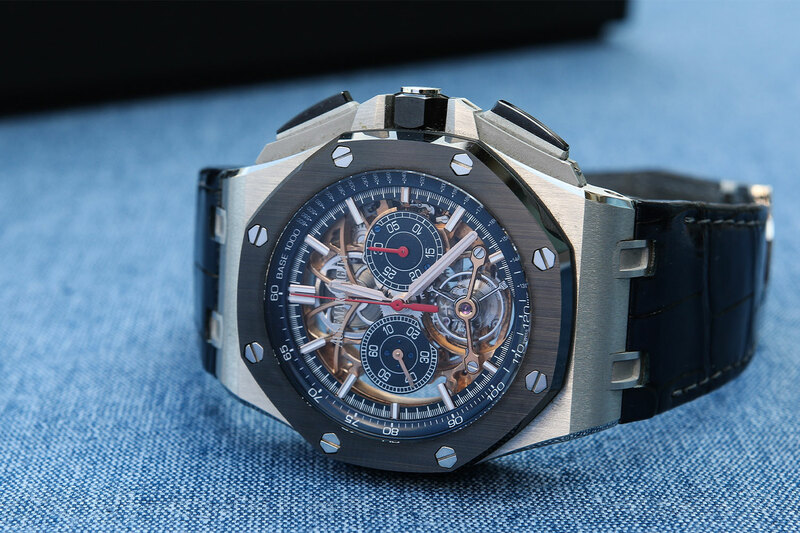 Collectors can choose what personal information they are comfortable with being out in the open, a welcome element especially when you are publicly displaying timepieces worth hundreds of thousands of dollars on the world wide web. 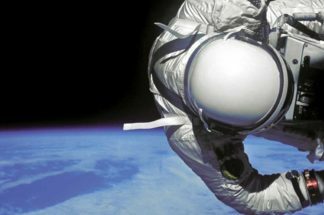 With one billion monthly users utilising the service, you are bound to see a wide variety of watch accounts, from businesses, to downright dubious accounts posting fake watches. Luckily, there is also an abundance of truly passionate watch collectors out there who make up an amazing community of horological hobbyists. @Conkers1971 is one of them. I stumbled upon his Instagram account one day when I was searching for a set of specific hashtags and was immediately impressed by the collection he proudly displayed on his feed. Don’t expect elaborately styled pictures, his feed features the bare essentials—wrist shots taken with a smartphone. The simple and amateur photography paired with his exquisite collection of high-end timepieces provide an attractive contrast that really stands out on its own and makes the experience of looking at his watches more relatable. Raise your hand if you take at least one wrist shot a day on your phone! 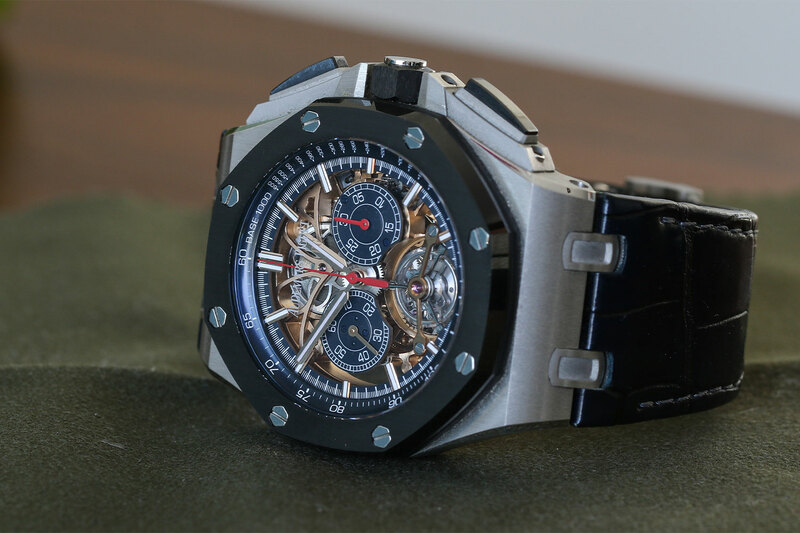 Revolution was recently invited to take a closer look at his stunning collection. As you’ll notice, there is a certain Patek Philippe bias but the rest is just as amazing. Let’s get into it! We start off with the big guns and let’s just say that it doesn’t get better than this. Here we have the Patek Philippe 5970 in all four metals: the 5970P (platinum), 5970G (white gold), 5970R (rose gold), and 5970J (yellow gold). To many collectors, they would consider owning a ref. 5970 in any variation a holy grail. 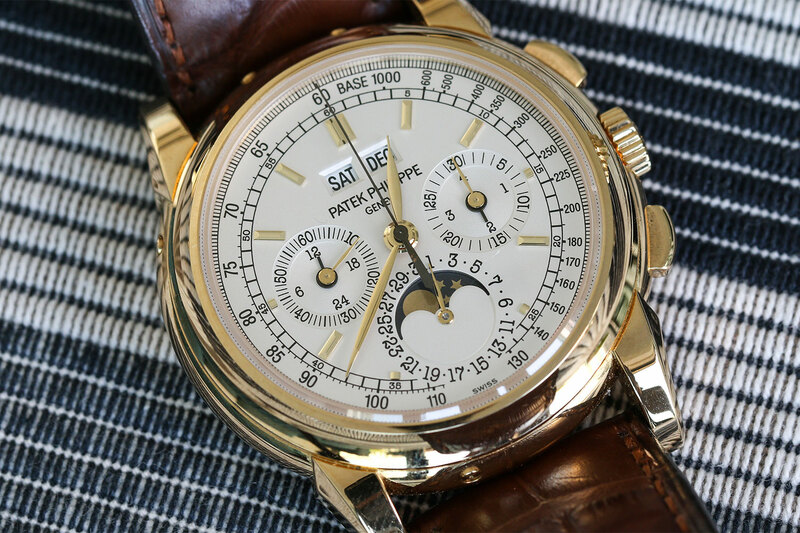 Having this Patek Philippe perpetual calendar chronograph reference in all four metals in the same room is a feat deserving of its own written article. And it did back in 2016, when Christie’s New York had all four of them on hand and our friends at Hodinkee fawned over them. My point is, owning the ref. 5970 in each metal is a huge accomplishment, one not very many can achieve. 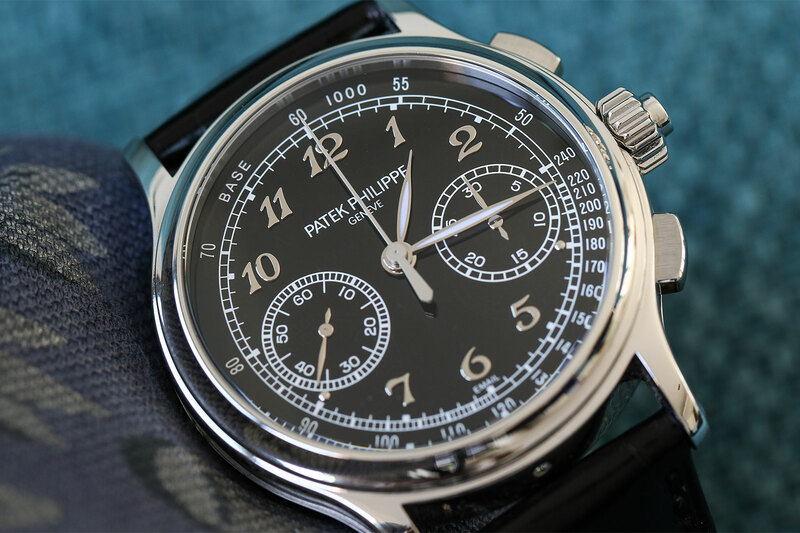 For many, the Patek Philippe ref. 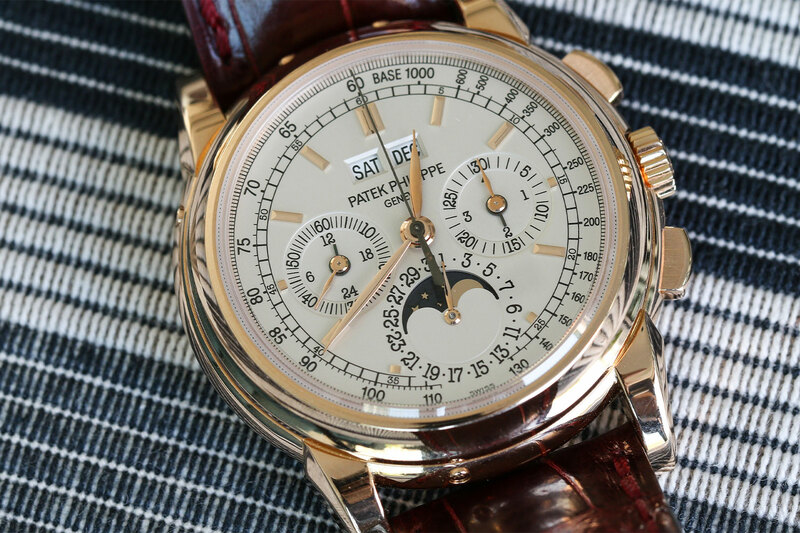 5970 represents one of the best Patek Philippe watches ever made. The watch features a contemporary 40mm case size, while retaining its link to the past with the use of the legendary Lemania 2310 base movement and the dial design identical to the ref. 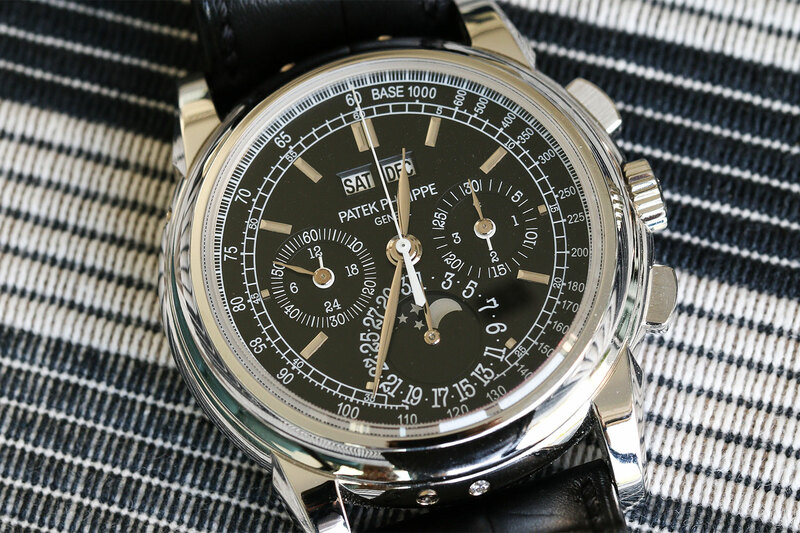 3970, an earlier perpetual calendar chronograph by Patek Philippe. With its seven year production run, from 2004 to 2011, the ref. 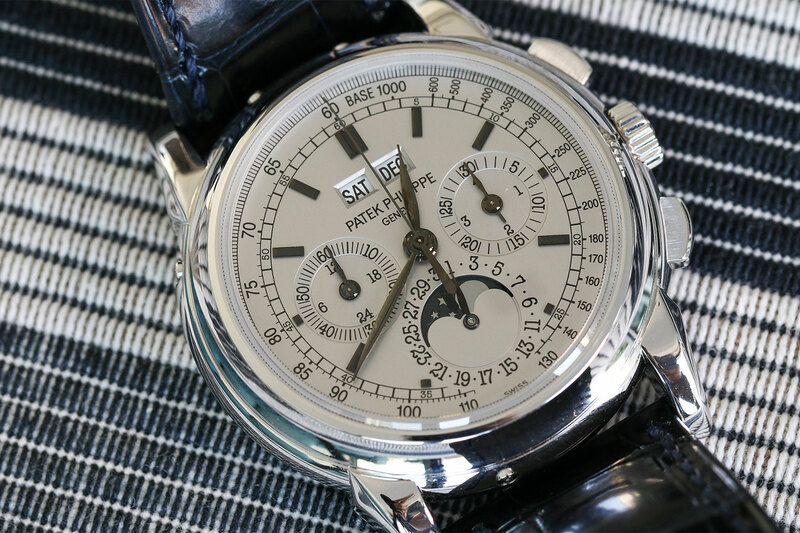 5970 also has the shortest production time of any Patek Philippe perpetual chronograph, making it quite a rare find. 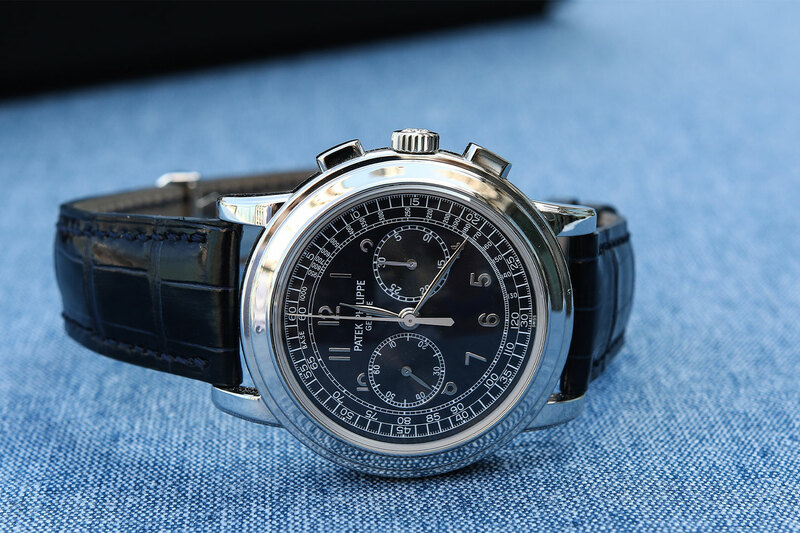 Continuing with the Lemania-based Patek Philippe, we find here the reference 5070P in platinum. A bit of a controversial reference for Patek Philippe as the 42mm case size was seen as quite large when the watch was released in 1998, and the movement fitted inside it was small for the wide space that the case provided. When introduced, the Patek Philippe ref. 5070 was the first simple chronograph (without a perpetual calendar complication) by the brand in almost 40 years and its production ran until 2009-2010. First we had the yellow gold version (J) followed by the white gold (G), rose gold (R) and finally, the platinum version (P) which ended the production run. While the J, G and R versions were produced for about four years each, the P was only available for the last year of the reference, making it by far the rarest metal of the family. The appeal of the ref. 5070 lies in the design of the timepiece, with its high polished case, stepped bezel and the beautiful dial with its two outer tracks, applied Arabic numerals and sunken subdials that give depth to the face of the watch. All this allows the watch to retain the dressy feel that comes with a Patek Philippe while also being just sporty enough to wear casually. Like the ref. 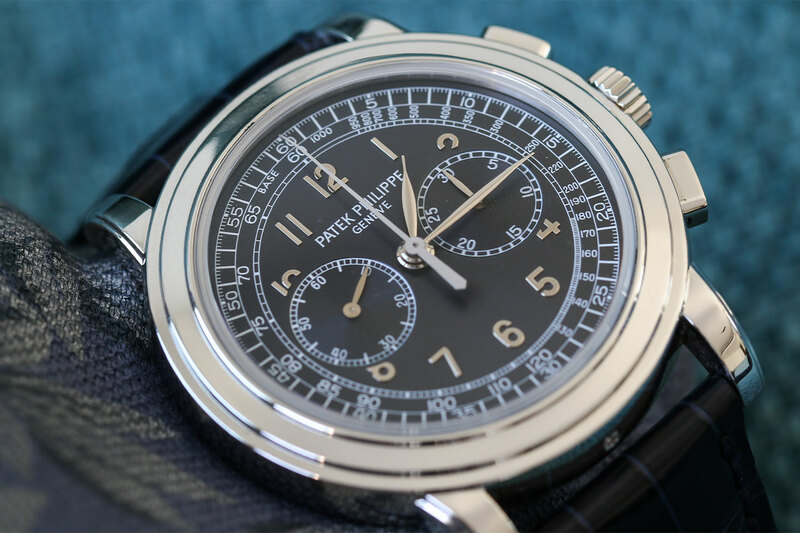 5970, completing the family of Patek Philippe ref. 5070 would be another amazing feat for a collector —something Conkers has not lost sight of. Next up is the Patek Philippe reference 5204P, also in platinum. The ref. 5204, launched in 2012 and still part of the current Patek Philippe catalogue, is the successor to the mighty reference 5004 produced from 1996 to 2011 and introduced an in-house movement from Patek Philippe to replace the previous Lemania-based movement found in the ref. 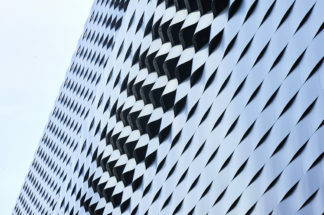 5004. 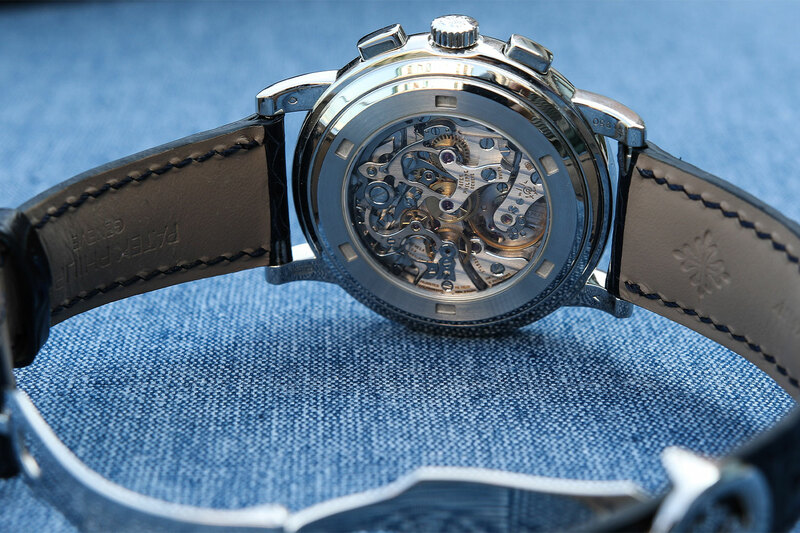 The case was also upgraded to a modern 40mm size with a clean and legible dial despite the complexity of the timepiece. Overall the ref. 5204 is an amazing modern piece and a worthy replacement to the ref. 5004. By now you must have noticed the affinity Conkers has with platinum. He explains that he prefers the bulk and heft platinum has, while being more resilient than gold, and hairline scratches don’t show as easily. “It looks more understated; it could be a steel watch to the casual observer and I like that understated element,” he told me. It came as no surprise to me that the ref. 5370 Conkers owns is also in platinum. 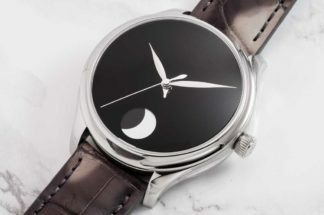 Many collectors consider it the best looking current generation Patek Philippe watch with its stunning black enamel dial made in-house by Patek that takes three hours just to polish. On top of that, the watch features Breguet numerals that are highly sought after by collectors and a split-seconds chronograph complication powered by the in-house Calibre CHR 29-535 PS built from the ground up by Patek Philippe. Let’s finish off this round-up with what could arguably be considered the end game in collecting: a customised unique piece. Being involved directly in the design process of a watch and going back and forth with your favourite maison is a dream for many, but being granted a custom commissioned piece can only be an honour, reserved only for the most special clients; a very special piece reflecting the individuality of the collector. 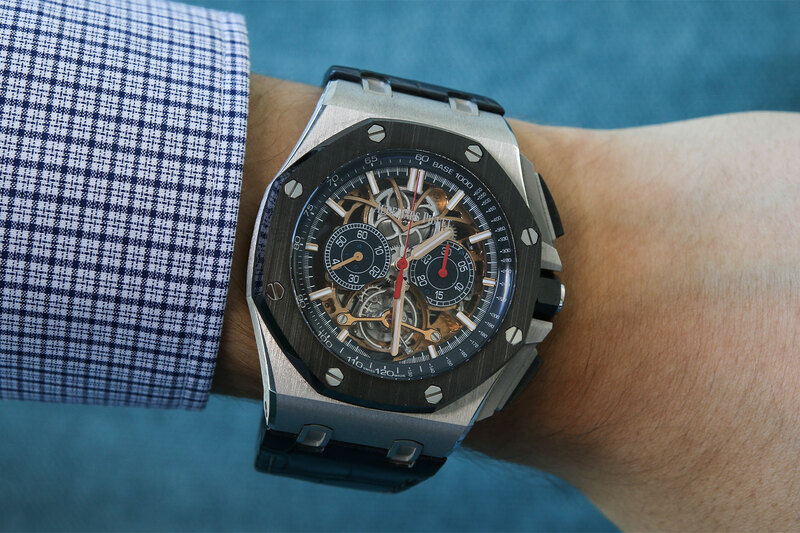 In this instance, we have an Audemars Piguet Royal Oak Offshore Tourbillon Chronograph Openworked in platinum—of course—which is not a metal available on the standard production version of this reference. Pay close attention and you’ll notice that the lugs are hollowed with sandblasted centres. 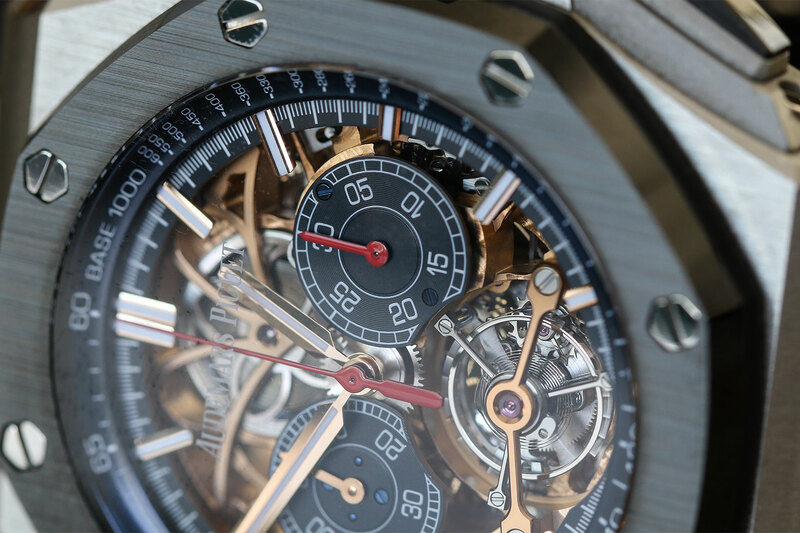 On the movement itself, we find rose gold finishing of the skeletonisation and several brass and yellow gold parts of the movement were changed to steel coloured parts to maintain a colour symmetry down the middle of the timepiece. The dial features a midnight blue tachymetre scale and subdials with blued screws to hold them down. The process of creating this unique piece took over a year and Conkers describes it as the most satisfying thing he has accomplished in his collecting history. “Every time I look at it, this is me. This is my design,” he explains, rather emotionally. 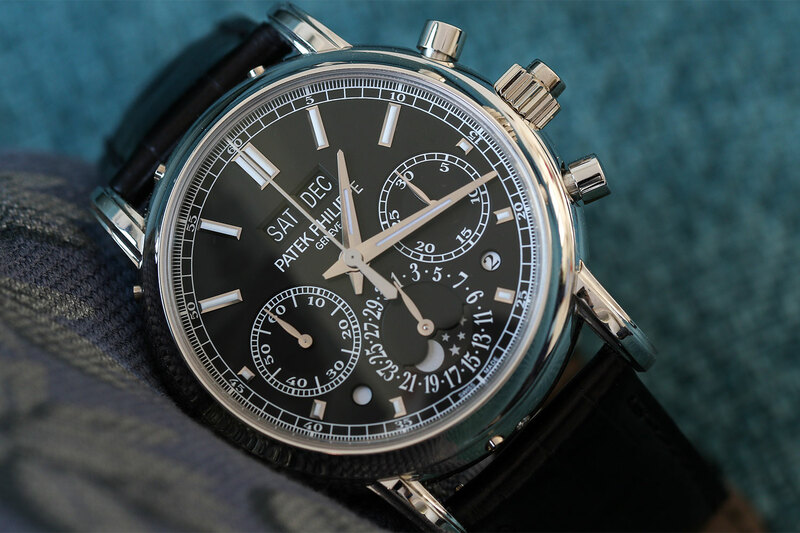 In the end, collecting might not be about the most expensive or rarest watch you can find, but rather what we connect with best on a personal level.